← What is a Busker? Dr. Martens boots have a history spanning over 110 years, with mass adoption by many teen sub-cultures throughout the past 50 years especially in the UK, but you might be surprised where the roots of this popular boot and shoe range originated. Doc Martens, DM’s or Dr. Martens boots to use some of the popular names for this footwear brand became popular with teen sub-cultures back in the 1970’s, however these iconic boots came to light literally by accident by the union of traditional British craft and German inventiveness. The creation of the very first Dr Martens Air Wair boot happened in April 1960, with the marriage of the production power of the Griggs family shoe factory and the inventive genius of Dr. Maertens of Munich, who offered up his idea for a new air filled sole for boots. This new idea, like many, was the result of necessity as Dr Maertens had received a foot injury on a ski trip and this new sole was designed to provide a cushion for the foot to aid recovery. 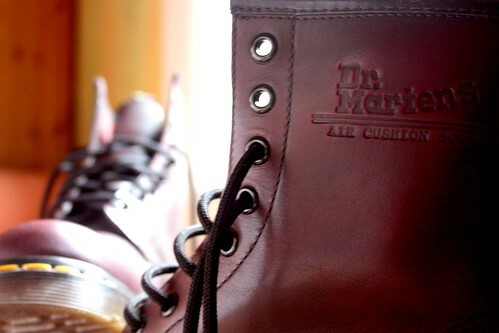 Bill Griggs, owner of the Griggs family footwear factory was browsing through industry magazines one day and spotted an advertisement for collaboration by Dr Maertens and the rest is history… with the Dr Maertens name being anglicized and turned into the Dr Martens brand. Progress was initially slow for the new brand, but these boots soon became popular with Policemen, postal workers and other workers who spent long days on their feet. The new ‘Air Wair™’ sole provided the support and comfort needed for long periods standing and walking, with the added advantage that these boots gave insulation from cold concrete and even snow – a great advantage to those people who worked in factories and outdoors. Things really took off for the Dr Martens brand when teen sub-culture started to adopt the boot as a symbol. First the skinheads took up the boot, with the 1460 black boot being the boot of choice and when Pete Townshend appeared on stage sporting his own 1460’s things really took off for the brand, with many wanting the same look. Subsequent music, fashion and youth movements have adopted the Dr Martens boot as their own, with everything from Britpop to Grunge utilising these iconic shoes as part of their wardrobe and of course fans flocked to buy. Innovations such as the move away from ‘black’ and ‘red’ – the original colours for Dr Martens boots – have seen an explosion of colour, with even flouorescent colours now being available for those who are brave enough to wear neon green or baby pink! This entry was posted in Covent Garden Stores. Bookmark the permalink.